April Aldighieri’s fine art photography has earned recognition all over the United States from art collectors and interior designers for her vibrant colors and striking landscapes. April travels all over the world in search of her next favorite image. Her work will transform your space with brilliant details of private New England gardens, amusement parks and catching a seascape in Newport, Rhode Island. She spent 10 years shooting the Seaside Heights Boardwalk before Hurricane Sandy of 2012 destroyed the iconic structures of the 1950’s. Most of her work is printed on polished aluminum. Aluminum prints have eye watering detail. They do not mind humidity because they are waterproof. They are super lightweight, sleek and ready to frame. A native of Brooklyn, N.Y., Rita W. Bond is a longtime resident of Simsbury and holds a Master’s Degree in English from Teacher’s College, Columbia University. After studying at the New York Botanical Garden, she became a landscape designer and lecturer. An interest in color and design led her to study art at the West Hartford Art League under Frank Federico, Ilona Levitz, and Bill Simpson, and others. She has also studied with Eric Aho in Vermont and Camille Przewodek at the Cape Cod School of Art. She is a member of the West Hartford Art League, Connecticut Academy of Fine Arts, and the Avon Art Association. Rita’s colorful art reflects her interest in capturing the transience of time and memory as she travels primarily through the landscape and coastal areas of New England. Her work conveys the seasonal and climatic changes in an abstracted impressionistic manner, as well as addressing the differences between looking quickly or in depth. 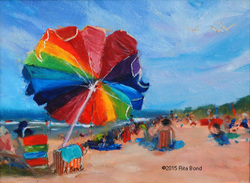 Rita’s paintings, created in oil, acrylic and pastel, have been shown in numerous juried art shows and local galleries. They are in collections in Great Britain and throughout the United States, including the permanent collections of the University of Connecticut Health Center and Bay State Medical Center. She has in many juried shows, including the Hartford Symphony, the Hospital for Special Care in New Britain, West Hartford Artwalk, the Connecticut Academy of Fine Arts. In 2015 her work received the Acrylic Painting Award at the West Hartford Art League CT+6. Solo shows have included Celeste LeWitt Gallery at the University of Connecticut Health Center and the Ethel Walker School Gallery. She has also been a visiting artist in the Simsbury, CT public schools and the Ethel Walker School. Rita is the founder and former president of Simsbury Open Studios.